Analog Man carries the Pigtronix ASDR Attack Sustain. The Pigtronix Attack Sustain is a polyphonic amplitude-envelope synthesizer that provides volume swell with variable attack time, compression / sustain and variable decay with automatic reset. The Pigtronix Aria XES Disnortion is a smooth and musical distortion pedal with a 3-band active equalizer. The Pigtronix Class A Boost will fatten up and boost anything you feed it. A really clean booster pedal which can also be used as a transparent buffer as it does not color your tone or add dirt. Analog Man carries the Pigtronix Philosopher's Tone, a state-of-the-art analog compressor / sustainer, providing endless clean sustain. Analog Man carries the Pigtronix Dual Expression pedal. It has two outputs, letting the musician control expression functions on two separate effects at the same time. There is currently no other expression pedal in the world that has this ability. In addition to the dual functionality of the Pigtronix EXP, the unit also has a polarity reversal switch to let you move the parameters of two separate effects in opposite directions. Analog Man carries the Pigtronix E2D Echolution 2 deluxe delay pedal. Analog Man is the only place to get the Pigtronix EP-1 Envelope Phaser now. We have the remaining stock and are calibrating them and testing them out before we ship them. It's a very unique and interesting pedal! 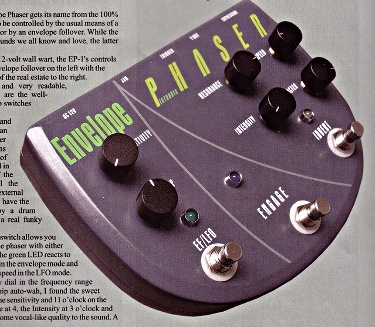 The Pigtronix EP2 Envelope Phaser can do normal phasing or envelope control or a mixture of both! The Envelope can go UP or DOWN when you play. Expression pedal control for manual phasing, or speed is also available. Comes with a power supply, in stock! The Pigtronix FAT Drive is an all analog tube sound overdrive. The FAT Drive’s multiple cascaded gain stages enable you to nail sounds ranging from bluesy overdrive to rich saturation.